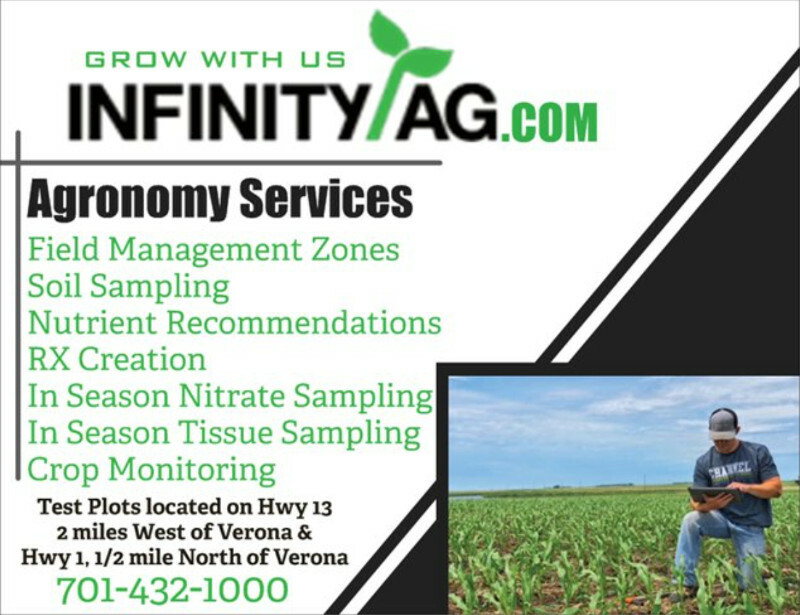 Infinity Ag has an exciting opportunity available in Verona, ND to students in Agriculture looking to benefit from a great in-depth experience into Agronomy and Precision Agriculture. We are looking for an individual with a focus in agronomy and strong communication, leadership, and problem solving skills. You will work extensively with out Precision Agronomist and Sales Team providing day to day support in the shop and field. Win the battle for higher yields. When you control down force, you avoid shallow-planted seeds and you avoid root compaction. In every foot on every pass, in each individual row, it monitors row unit weight and ground contact, then instantly and automatically adjusts to maintain the depth you set. You get your best possible yield, your best possible return on investment. Maximize Your Farm. Call 701-432-1000 for more information. Thank you to everyone that made it to our Plot Tour/Customer Appreciation. 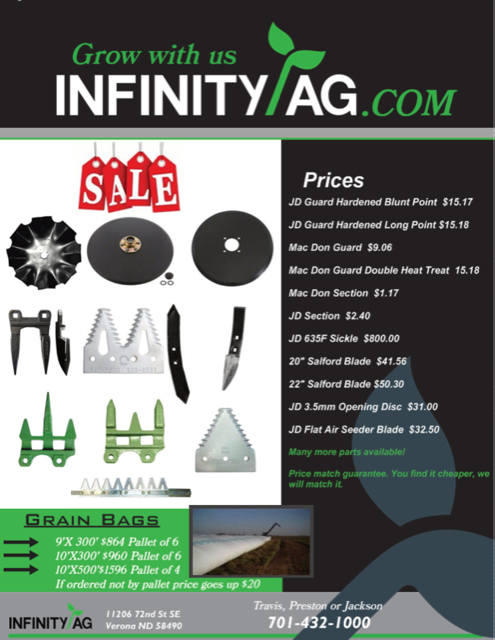 Download full size sale information (PDF). Give us a call at 701-432-1000 for more information. 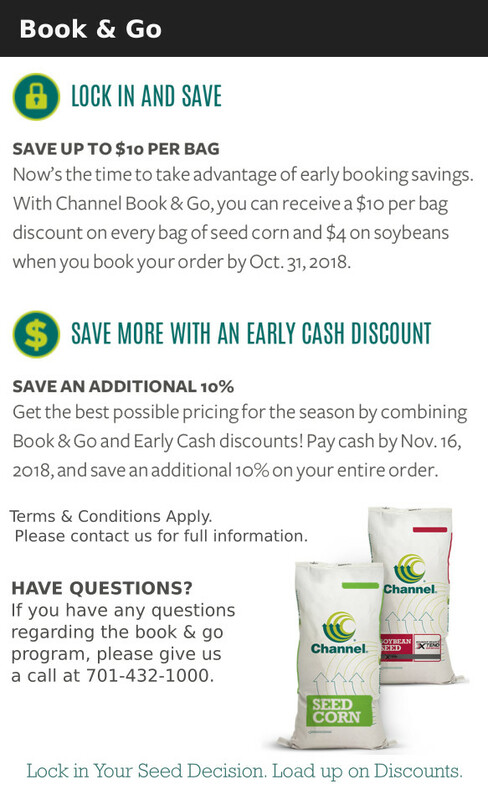 Field management zones, soil sampling, nutrient recommendations, RX creation, in season nitrate sampling, in season tissue sampling, crop monitoring, and more! Give us a call at 701-432-1000 for more information. Whether it be a basic or advanced system, we can customize to your needs. 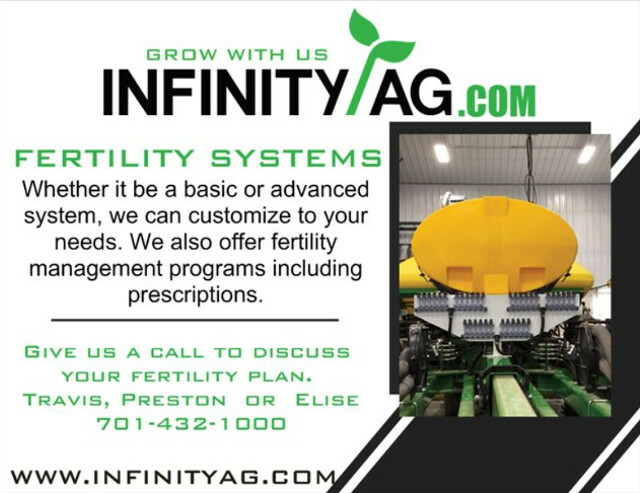 We also offer fertility management programs including prescriptions. Give us a call to discuss your fertility plan. Call Travis, Preston, or Elise at 701-432-1000. 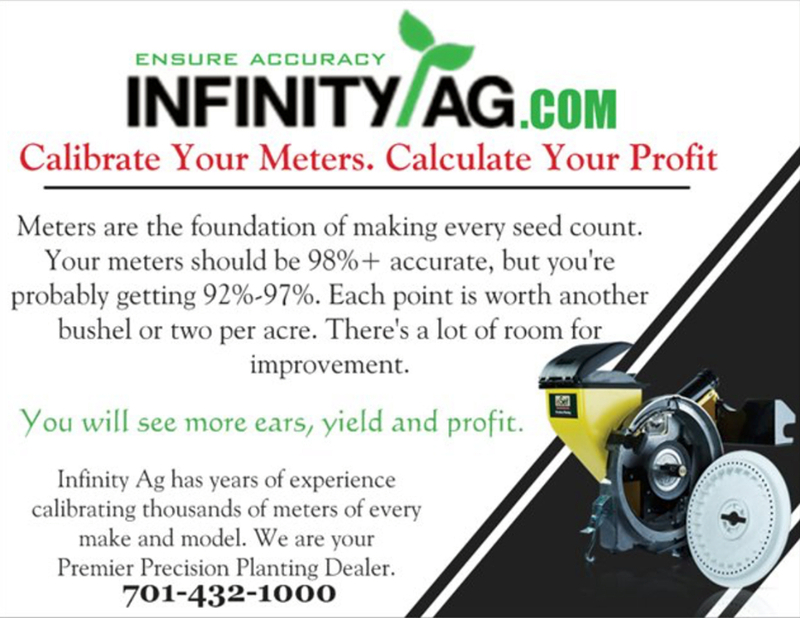 Meters are the foundation of making every seed count. Your meters should be 98%+ accurate, but you're probably getting 92% - 97%. Each point is worth another bushel or two per acre. There's a lot of room for improvement. Call Travis, Preston, or Elise at 701-432-1000 for more information. 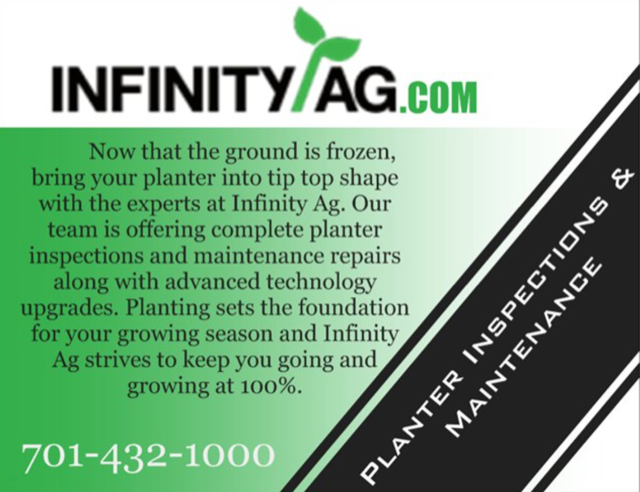 Now that the ground is frozen, bring your planter into tip top shape with the experts at Infinity Ag. 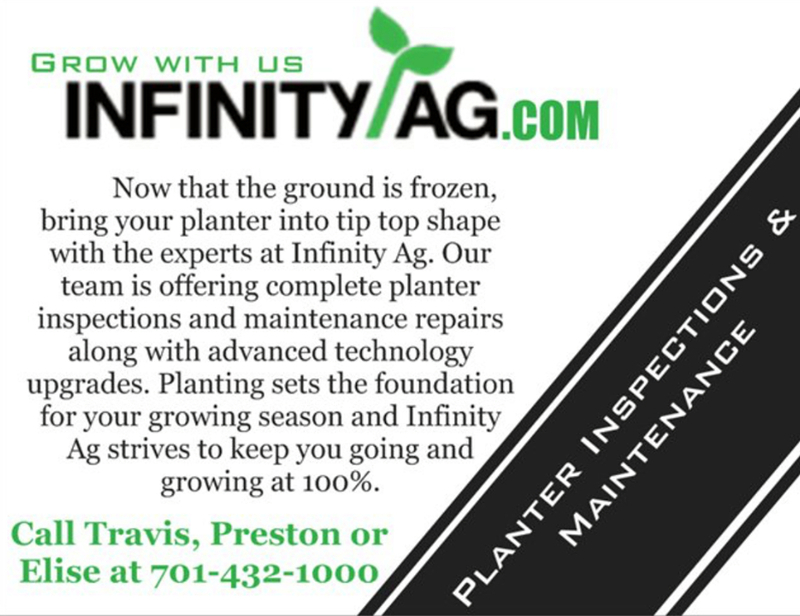 Our team is offering complete planter inspections and maintenance repairs along with advanced technology upgrades. 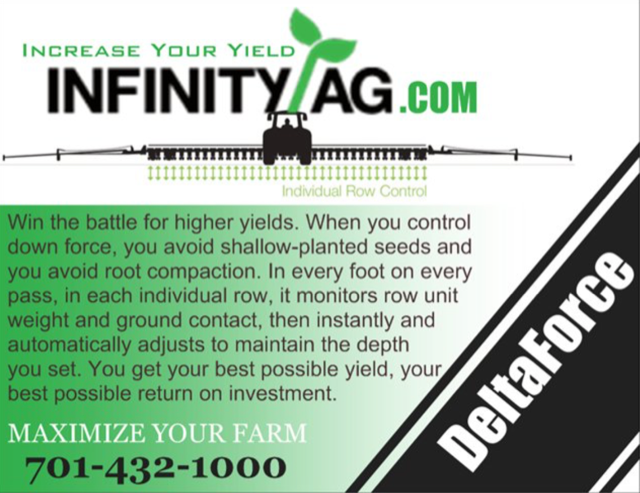 Planting sets the foudnation for your growing season and Infinity Ag strives to keep you going and growing at 100%.